Easy and quick to prepare, this hearty, rustic bread is great for your weeknights at home or celebrations like St. Patrick's Day with your friends. Unlike traditional Irish soda bread recipes, it's dairy-free, butter-free, and egg-free, and can be served to all guests, regardless of differences in diets. You'll find this recipe turns out a crispy crust with a soft, tender center. Preheat the oven to 400 F. Lightly grease a baking sheet and set aside. In a small bowl, whisk together the dairy-free almond or soy milk and the cider vinegar. Let stand for 5 minutes, or until slightly thickened. In a medium-sized mixing bowl, sift together the flours, baking soda, baking powder, and salt, making a well in the center. Pour in the liquid mixture and mix with your hand or a wooden spoon, working in concentric circles from the inside out until the dough comes together. The dough should not stick to your hands but shouldn't be dry either; add flour as needed. Turn the dough out onto a lightly floured surface and form into a round shape. Place the loaf on the prepared sheet and bake for 45 to 55 minutes, or until the loaf is golden brown. Let cool on a wire cooling ​rack before serving. Irish soda bread is versatile in that it can be served warm, at room temperature, or toasted, but storing it is more nuanced. It can dry out easily, so it's important to keep it wrapped up tight in foil or plastic wrap, up to 3 to 4 days. Thereafter, it can be frozen up to two months. When freezing, double wrap the bread, first in plastic wrap, then in aluminum foil to avoid freezer burn. To reheat, thaw at room temperature completely. Then place in a 300 F oven, sliced or whole, for 10 minutes to soften just before serving. 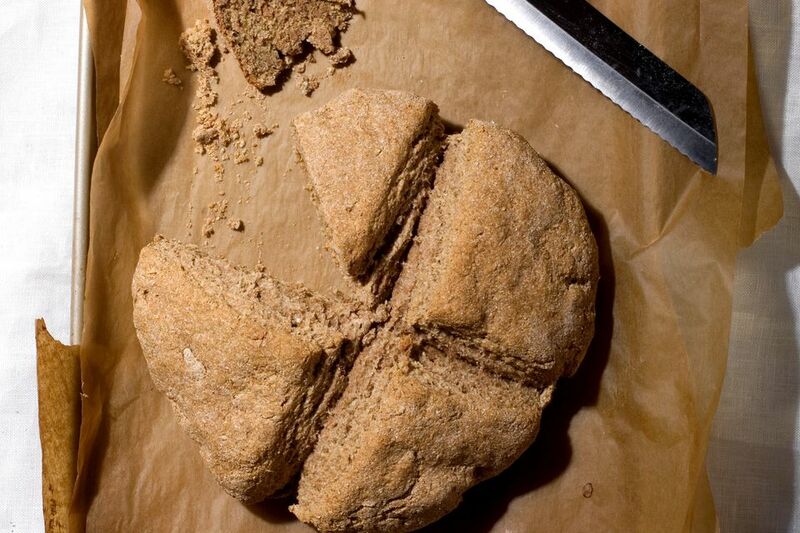 This traditional Irish soda bread is brown, course, and contains no fruit. Some varieties, however, add raisins, grains such as bran and barley, and even nuts. It's up to what to add to make it your own. You can serve the bread toasted with fruit spread such as orange marmalade or apricot spread. If serving warm straight from the oven, you can keep it simple and serve it sliced with butter alongside a meaty dish. If serving room temperature for lunch, go with blue cheese or Dijon mustard alongside a soup or stew.